Mini Modern: Rocket. I’m Taking A Rocket. Rocket. I’m Taking A Rocket. 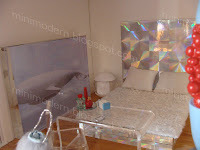 The platform bed and wall art are acrylic picture frames. 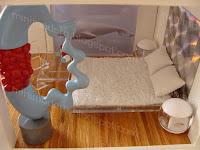 The bedside light tables are also picture frames. 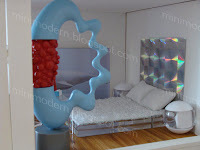 The sculpture is from the Kaleidoscope House accessories. 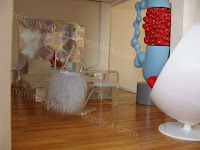 The ball chair is from Reac Japan. 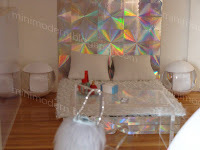 The chair and table are eBay finds.